For those of you who have not heard of Shanaze Reade check her out – this girl is awesome! Starting aged 10 on the BMX track, by the time she was 17 Shanaze was Britain’s number one women’s rider, having competed in the elite men’s category throughout the British series to improve her skills. Soon world titles followed alongside track cycling to keep fit for BMX racing. As it turned out Shanaze was pretty damn good at this too and found that her power and strength worked well in the velodrome. In 2007 she was chosen to be the lead-out rider in the women’s team sprint with Victoria Pendleton which lead to the pair winning world titles in 2007 and 2008. I could easily go on to list a whole host of further achievement Shanaze has achieved but I wanted to point you in the direction of her latest feat – setting a new Guinness World Record! A few weeks ago Shanaze became the fastest person ever to cycle around a ‘Wall of Death’ on a pedal powered bike. A ‘Wall of Death’ is a silo or barrel shaped wooden cylinder, typically ranging from 20 to 36 feet in diameter and made of wooden planks, inside which motorcyclists, (or a cyclist in this case!) travels along the vertical wall and perform stunts, held in place by friction and centrifugal force. For more on this badass woman check out the full article by Road.cc. or follow Shanaze on Twitter. Image main credit to Bristol BMX Club. The winners of this year’s Sean Conway Adventure Scholarship are mother and daughter Addi and Athina (age 8). Together they will be kayaking down the Leeds-Liverpool canals, a distance of 127 miles (204km), which they expect to take 6 days. The kayaking trip is part of a year of adventures that will also include a half marathon, an iron man, and a Mini Olympics for schools. They have even arranged an international Mini Olympics at a school while they are on holiday in Madrid! For their kayak-swim challenges, Athina will sit inside the kayak and give support along the way. Team AA hope to create a world where more children can be introduced to the benefit of sport, as well as raising funds for the Jane Tomlinson appeal. They are fantastic role models and are sure to inspire young people with their active lifestyle. We can’t wait to see more of their adventures! Follow them on their Team AA website and blog, and on twitter @Ourgreatproject. Sarah Outen – cycling, rowing and kayaking around the world! Back in April 2011 Sarah Outen set out from Tower Bridge on her London2London: Via the World expedition. Her goal was to row, bike and kayak around the northern hemisphere, inspiring children and fundraising for charities. Reading about her journey is so inspiring, in everything I have read about Sarah, she comes across as totally down to earth and really relateable which is so cool to see. I have no doubt she has inspired a lot of individuals young and old to take on their own challenges. Sarah completed her journey on the 3rd November 2015 arriving back in London, England after 1676 days, 23 hours, 25 minutes and 0 seconds – that’s 4.5 years covering over 25000 miles! Her book ‘Dare to Do’ about her expedition will be out in May 2016. You can read the full interview with Cooler here. Visit Sarah Outen’s website click here. When I’m not outside climbing, biking or running most of my time is taken up by either preparing for adventures or searching for inspiration. I can not tell you how many blog posts and videos have helped my push myself or discover that little bit more I didn’t know I could give. So today I wanted to share a little piece on my most recent source of inspiration. I’m not quite sure how I came across Karen Darke’s blog (I think it was Twitter) – but this women is amazing! A climber, adventure and paralympian, Karen is currently a full-time athlete with the British Para-Cycling Team, training for the 2016 Paralympics. When she’s not training she has fitted in some pretty awesome adventures such as sit-skiing across Greenland, climbing El Capitan and handbiking from Tibet to Nepal to name but a few! Then as if she was not busy enough training Karen is also the Founder of Inspire & Impact, and works as a speaker, coach and facilitator! She uses her powerful personal experiences to create positive impact in the lives, health and work of others. So if you are looking for some mid week inspiration check out Karen’s website, it’s definitely worth a read, I can’t stress enough how awesome this women is! There are a whole range of great films about Women in Adventure online at the moment inspired by the BMC‘s Women In Mountain Adventure film competition. Here is one of my favourites – Girlie & Burley – as a climber I can totally relate to wanting to be strong and try the really physically challenging routes. To view the other amazing films that entered this year click here. Check out these four incredible women who are aiming to set the world record for not only being the first all female team to row the Pacific Ocean, but also the first ever fours boat to row the Pacific Ocean. And if that wasn’t enough they are also aiming to be the fastest ever Pacific Ocean row! In this epic challenge they are aiming to raise over a quarter of a million pounds for 2 charities, to support those who show true resilience; Walking With the Wounded and Breast Cancer Care survivors. The money they raise for Walking With the Wounded will be setting up the first ever fund for injured servicewomen and supporting their re-education and re-training pathway to create a new journey and focus for them after injury. Then the money raised for Breast Cancer Care will continue to support the carers and services that BCC provide to those fighting breast cancer and their families. For more on their amazing journey and to follow their progress visit their website! October 2015 I went to an evening hosted by Jagged Globe, amongst a series of great talks I was most looking forward to hearing Rosie Swale Pope speak. As soon as she started talking I was transfixed by her stories, something really struck a chord with me. I found, especially as a runner, I could relate to so much of what she was saying. I came out of that talk totally fired up and felt ready to take on any adventure that was thrown at me, and more! I also instantly purchased Rosie’s book – Just a Little Run Around the World. This follows one of her most notably stories – a 5 year solo run of 20,000 miles around the world, to raise money in memory of her late husband. From being followed by wolves to trekking across Alaska, and having to survive in temperatures of -62 degrees C. Rosie was knocked down by a bus and confronted by bears – I couldn’t take my eyes off the pages of this book. But don’t worry I haven’t told you all that happens there are plenty more epic moments! I can whole heartedly recommend this book to both runners and non-runners – I think anyone with a spirt of adventure will find this a fantastic read. Sasha DiGiulian is a professional rock climber. 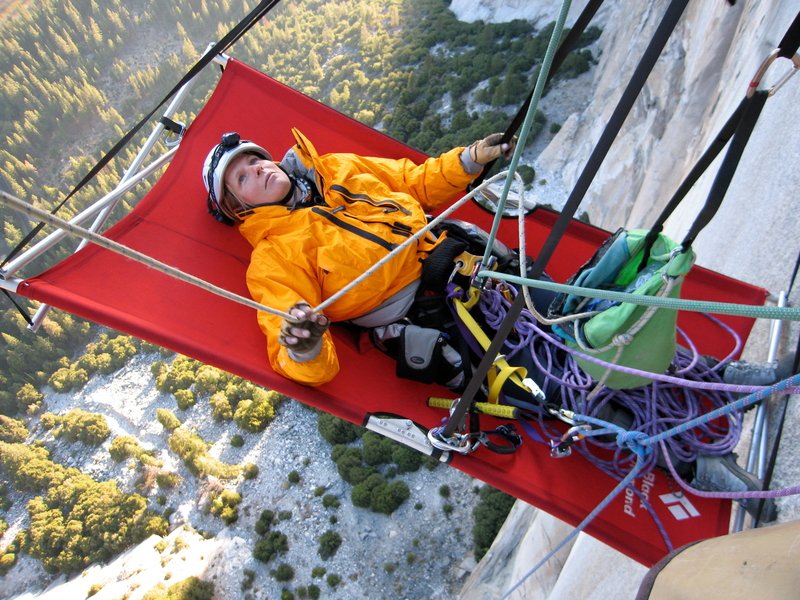 She has completed ground breaking multipitch and big wall routes, led one of the hardest sport routes ever climbed by a woman (9a/5.14d), and achieved numerous first female ascents around the world. She is also an Ambassador for the Women’s Sports Foundation and a published writer, so generally all round inspiring! Sasha has launched a YouTube channel so that we can get a behind-the-lens look at her climbing adventures across the world. Catherine Destivelle, Rock Queen (2015) (First published as Ascensions, 2013): Catherine Destivelle is one of the world’s most accomplished rock climbers and alpinists, making world-leading solo winter ascents of the Eiger, the Matterhorn, and the Grand Jurasses. Her book tells how she discovered a love for the mountains as a young girl, developing her talents through bouldering, rock climbing, and eventually solo winter climbing. A career as a professional climber presents its own challenges for a naturally introverted character. Balancing the demands of sponsors and pressure to be publicised against her own instincts, and faced with decisions about whether to enter high profile competitions or attempt hard new routes, Catherine learned to follow her passion and do what she loves to do. Cathy O’Dowd, Just For the Love of It (Dec 13): This is Cathy O’Dowd’s story of how she became the first South African to reach the summit of Everest and the first woman to reach it from both sides. It includes absolutely gripping descriptions of alpine climbing, especially the summit attempts. Confronting the costs as well as the rewards, it gives a vivid description of the harsh reality of life at the absolute limits of human endurance and beyond. It can feel hard to understand the motives of individuals that choose these tough experiences, but Cathy absolutely captures the atmosphere and landscape of expeditions in the Himalaya. With descriptions creating images as clear as pictures, there is no doubt that as the title says, she does it for the love of it. Gerda Maria Pauler, Great Himalaya Trail: 1,700 Kilometers Across the Roof of the World (Oct 13): This book is about Gerda Pauler’s hike of the Great Himalaya Trail, 1,700 kilometers on foot across Nepal to raise awareness for the charity Autism Care Nepal. Despite her humorous descriptions of the journey, this is a serious undertaking requiring stregth of character and positive thinking. Crossing many high passes, some at altitudes of over 6,100m, every extreme of weather is encountered as well as the dangers of route finding, rockfall, and avalanche. Taking four months to complete her adventure, Gerda is immersed in the local culture. Having visited the area over a period of 25 years she records her keen observations of the people she meets along the way, in particular the children and women. Changes are occuring, and there is a fine balance in delivering improvements in education and infrastructure that come with tourism and economic development while preserving the unique cultures and traditions of Nepal.